Berndt Clavier opened the seminar by describing an ongoing momentum in Heidegger studies that has seen his work being increasingly picked up on by disciplines nominally outside of philosophy. How much of the most interesting writing on Heidegger is currently happening in these non-philosophical spaces. 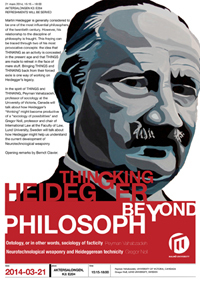 Heidegger’s “thing thinking” is bound to take one outside of philosophy. Indeed, the very question of being that took Heidegger into philosophy was what eventually took him out of it as a result of his emphasis on practices of being. Clavier pointed to Heidegger’s ‘Origin of the work of art’ essay as a key point of reference for the seminar, with its highlighting of the predicative disposition of language that constructs a seeing subject and passive object, and all of the subsequent entailments of such an arrangement in which every thing is made to substantiate the subject, as can be seen in the array of conventional representational apparatuses and their theatre of anthropormorphisms. Clavier then opened the floor to Vahabzadeh, pointing out that the social sciences carry a memory of these objectifications as they occur and thus are more well-placed than philosophy to use Heideggerian thought.